What is the role of the a priori nature of time in intuitionism? According to Brouwer, intuitionists abandoned Kant's apriority of space but adhered to the idea that time was a priori. This Intuitionism considers the "falling apart of moments of life into two qualitatively different parts, to be united only while remaining separated in time" as the fundamental phenomenon of the human intellect. I don't at all understand this. What does this mean? Quote from Brouwer, "Intuisionism and Formalism"
The quote describes what Brouwer calls the first act of intuitionism, the splitting off of discrete from the comprehensive intuition of which discrete and continuous are idealized poles. 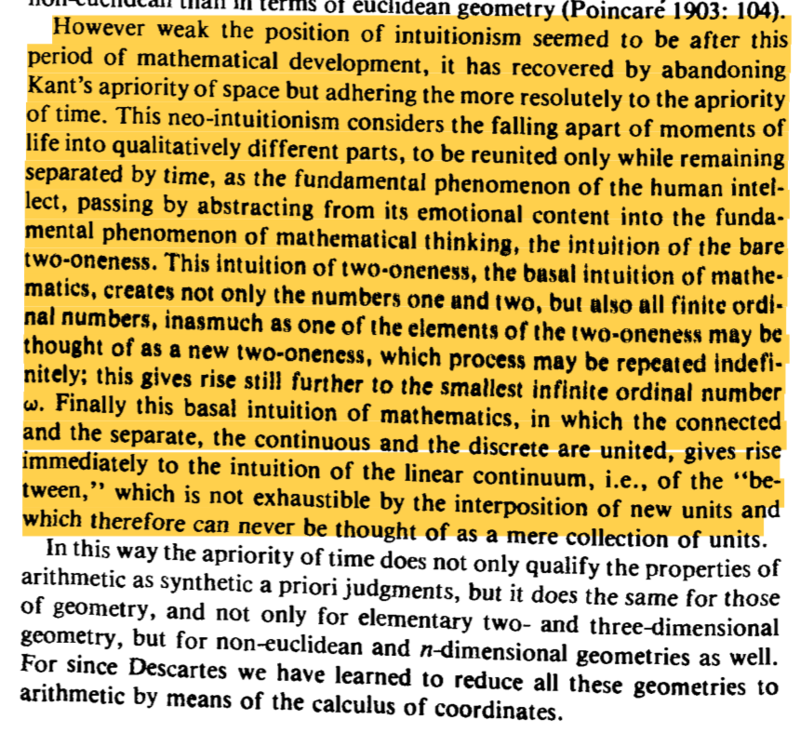 "Brouwer says that this first act separates mathematics from mathematical language and recognizes that intuitionist mathematics is a languageless activity of the mind having its origin in the perception of a move of time, i.e., of the falling apart of a life moment into two distinct things, one of which gives way to the other, but is retained by memory. This ‘two-ity’, divested of all quality, is the empty form of the common substratum of all two-ities. In this common substratum, this empty form of all two-ities, lies the basis of the discrete aspect of the primordial intuition of mathematics. It successively generates each natural number and arbitrary finite sequences. It is natural to suppose that it lies at the basis of the finite combinatorial objects that could be generated from the natural numbers. Brouwer gives precedence to ‘two-ity’ in his account of the natural numbers. It is not good enough to merely start with a unit to obtain the natural numbers. Once we become aware of a sensation passing into another sensation, for example, we have the foundation for the abstract two-ity out of which the natural numbers are generated. Suppose we were to mark this awareness as ( | ) | to indicate the retention in memory of what was sensed earlier. This ‘two-ity’ can then be an element of a new two-ity: (( | ) | ) |, and so on... Brouwer emphasizes how in this successive, sequential structure with its ordering of ‘before’ and ‘after’ the ‘before-after’ or ‘first-second’ are held together in consciousness so that we have unity in multitude." While the construction is in process there will also be some more or less determinate protentions (which are similar to expectations—but only roughly, see below) at any stage about how it will unfold and about its completion. In the case at hand this is completely determinate. It is clear that this will be a lawlike or rule-governed becoming. The future course of experience is fixed: it is simply the iteration of successor." Moving from rule-governed to "lawless", free choice, construction, which creates the mathematical continuum, is the "second act of intuitionism". One way of seeing this is to recognize that the notion of “present,” as sandwiched between past and future, is simply a useful hoax. After all, if the present is a moment in time without duration, it can’t exist. Both Plato and Aristotle saw in mimesis the representation of nature. Plato's distinction between eikastic and phantastic representations, seems very much on point here. For example a photograph (representation of the past) has limited capacity to convey reality (the moment), perhaps an artistically altered image may better convey the (now past) moment? Which is better? Why? Not the answer you're looking for? Browse other questions tagged metaphysics philosophy-of-mathematics time intuition or ask your own question. How do proponents of the Cosmological argument respond to the nature of time? Is to understand the nature of time considered metaphysics? What are conceptions of time and space? what is the concept behind time machine? What is the nature of moral intuition according to Haidt?